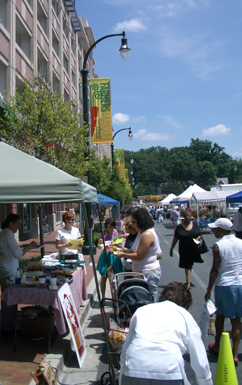 Silver Spring Farmers' Market operates every Saturday between April and December. And although it is not the biggest farmers' market around, the great thing about it is that it is in the heart of Downtown Silver Springs so you can have a bite to eat afterwards at one of the many restaurants available, or just put your feet up and have a cup of coffee. The other convenience comes in the form of free parking on Saturdays at the public garage, adjacent to the market site, so that after your shopping you can load up your car with all your goodies before heading off for that cuppa. At this market you'll find goats' milk cheeses, tree and field fruit, vegetables, honey, eggs, meat, pies, preserves, salsas, cut flowers, breads, pastries and more.